Washington, DC— Planet-hunting is an ongoing process that’s resulting in the discovery of more and more planets orbiting distant stars. But as the hunters learn more about the variety among the tremendous number of predicted planets out there, it’s important to refine their techniques. New work led by Carnegie’s Jonathan Gagné, Caltech's Peter Gao, and Peter Plavchan from Missouri State University reports on a technological upgrade for one method of finding planets or confirming other planetary detections. The result is published by The Astrophysical Journal. One of the most-popular and successful techniques for finding and confirming planets is called the radial velocity method. A planet is obviously influenced by the gravity of the star it orbits; that’s what keeps it in orbit. This technique takes advantage of the fact that the planet’s gravity also affects the star in return. As a result, astronomers are able to detect the tiny wobbles the planet induces as its gravity tugs on the star. Using this method, astronomers have detected hundreds of exoplanets. For certain kinds of low-mass stars, however, there are limitations to the standard radial velocity method, which can cause false positives—in other words, find something that looks like a planet, but isn’t. 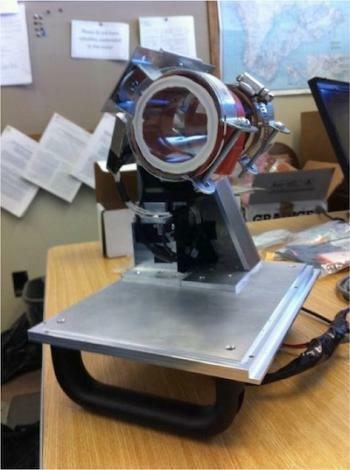 Caption: The tool that allowed the team to improve planet hunting in the near-infrared—a cell that contains methane gas. Image is courtesy of Peter Plavchan.